The way we think is fascinating. We arrive at certain beliefs, and based on these, we build a structure of thinking. Certain beliefs are more basic, more foundational than other beliefs. Whenever you think about something, it is reliant on some kind of foundational, underlying belief. In modern philosophy, this concept on the way we think has been elevated. While everyone has this sort of general foundationalist way of thinking, Modern Philosophy has determined that the only way to arrive at “Truth” is through arriving at foundational beliefs that are absolutely certain by way of Reason. René Descartes, in rejecting medieval assumptions of authority, submitted that there exist unquestionable beliefs that we can know by way of Reason—he posited that we can overcome uncertainty about what we believe by grounding all other beliefs on the invincible certainty of immutable foundations. This is what has come to be known recently as “Foundationalism”—the philosophical theory that any belief must be “based” on something that is “foundational” and thus immune from criticism. Therefore, the way to criticize any belief is to determine if it is “based” on a good “foundation.” If you cannot justify what you believe by showing how your beliefs relate to more foundational beliefs (you can’t have a “circular argument”), then your beliefs are called into question. The questions that postmodernists raise to Foundationalism are: “Is such an approach to knowledge possible?” and “Is it desirable?” (as John Franke states in his essay, “Christian Faith and Postmodern Theory” in Christianity and the Postmodern Turn). So, while we accept that we all generally think in a foundationalist fashion (basing what we believe on “basic” beliefs), we reject the Cartesian Foundationalism of modernity that says that we can arrive at indubitable beliefs by way of Reason. Reason is not a god to whom we should be bending our knees. Let’s face it: the only “foundation” upon which any of us base our beliefs is that which we want to believe. Postmodernists even have a “foundation” in this regard: They base their beliefs on the idea that they cannot know anything absolutely! So, it has been, and always will be, a matter of faith: At that basic level, in what or in whom do you believe? Now, Christians believe at that basic level that God is really “out there” (as the ultimate “marginalized voice”) seeking to be heard. They base this basic belief on the intriguing and demanding story that this God actually became incarnate and lived here among us. Not only do they base their beliefs on this foundational belief in the historical Jesus, but they also base it on their actual personal and corporate experience of this Living God invading their souls and their communities by way of the Holy Spirit—an experience that they cannot dispute, even in times of doubt. Where Christian apologetics in the modern era sought to explain “Evidence that Demands a Verdict” (a form of apologetics that served its purpose in the modern era but would have been foreign in the pre-modern era and is increasingly foreign in the postmodern era), Christianity in a postmodern era must instead invite people into interaction with this Living God. Now, if a person is absolutely resolute about not interacting with the Living God, then they are operating on a set of basic beliefs that says, “I don’t think there is a God,” or “I doubt that if there is a God that God would want to communicate with me,” or “I don’t think I could possibly understand God if he did try to interact with me,” or some other base belief on this spectrum. Note that all these are “foundational beliefs;" some are based on “reason,” others are based on something else. A Christian apologetic, then, must emulate Jesus of Nazareth: It must be incarnational. We allow the Christ that lives within us (through the Spirit) to transform the way we love God and love others. We allow the Christ that lives in our local communities (our churches are “temples” of the Holy Spirit [1 Cor 3:16]) to transform the way we live corporately to transform the world around us. And then we invite people into this living, vibrant life that characterizes the Shalom Peace of God. This gets beyond the Cartesian Foundationalism of “Reason” and openly embraces that we indeed have a "foundation" for all we believe and all we do--our experience with the Living God in our midst. Scripture, by its own attestation (2Tim. 3:16) and through its use of multiple literary forms and genres, contains more than just propositional revelation. Thus, when we reduce the content of the biblical revelation to propositions we dangerously distort the text with modern philosophical assumptions about the nature of truth and meaning...A postpropositional approach to Scripture places its confidence in Scripture because of its ability to 'make us wise unto salvation,' not because it is a storehouse of universal, infallible true propositions." Postmodern evangelicals will affirm that the hermeneutical task in regards to Scripture is interminable for at least three reasons: 1) because of the continually evolving socio-cultural and personal contexts in which we read Scripture and in which God speaks to us through Scripture; 2) because the intentions of God expressed in His scriptural speech-acts are, in keeping with His being, potentially inexhaustible; but also, 3) because the conceptual-linguistic form of God’s revelation to us in Scripture means that we can never lock down its meaning in one exclusive set of timeless propositional truths. "MO "and Adam offer an insightful series on the film, "What the Bleep Do We Know?" at their websites. Link for the series here. WHO: Open to anyone who wants to talk about the emerging church, including those seeking to understand postmodern ministry on the college campus. RESPOND BY: October 10 (write a comment below). Bob Robinson, Area Director for Northern Ohio for the CCO (Coalition for Christian Outreach), has arranged an interaction time with Tony Jones, the National Coordinator for Emergent-U.S, on Sunday night, October 16th at 8:00 PM (note time change!) at the Open Door (801 N. Negley Ave. in the Union Project, Pittsburgh) after the Open Door’s evening worship gathering. Also present for the discussion will be Pittsburgh-based emerging church leaders, including B.J. Woodworth, pastor of the Open Door. Tony Jones is the National Coordinator for Emergent-US, the leading voice in the emerging church movement exploring how to do Christian ministry in a postmodern culture. He is finishing his Ph.D. in practical theology at Princeton Theological seminary. Previously, he was the Minister to Youth & Young Adults at the Colonial Church of Edina in Minnesota. Educated at Dartmouth College and Fuller Seminary, Tony is the author of Postmodern Youth Ministry (YS/Zondervan, 2001), Soul Shaper (YS/Zondervan, 2003), Read, Think, Pray, Live (NavPress, 2003) Pray (NavPress, 2003), and The Sacred Way (Zondervan, 2005). Here is one aspect of postmodernity that we should applaud: In its insistence that there is no single human perspective that provides the ultimate “Truth” about reality, postmodernists desire to listen to the marginalized voice—the voice that has been oppressed in the power-grabbing word games that epitomize modernity. Christians should actually embrace this, joining with postmodern philosophical criticism of all “isms,” and affirming that we too should be against any oppressive system of thought. This includes our own “graven ideologies” (as Bruce Ellis Benson calls them); we need to be critical of our own “isms.” This is what gets certain Christian leaders’ feathers ruffled, especially when those in the Emerging Church are critical (because of their postmodern sensibilities) of the traditional systems of thought that have dominated the church for the last 400 years (especially that ultimate “ism of isms,” Calvinism). The postmodern concern for the marginalized voice is something that is very biblical. And, strikingly, when we read the Bible, the voice that most often gets marginalized is the voice of God. The Word of the Lord goes out to the people, and more often than not, the people ignore it. Instead of listening to this voice of grace, mercy, hope, and peace, the people instead go after their own particular interests, suppressing anyone who would speak for God. The people know that the Word of God says they are to be a blessing to others, but they instead want to be a nation capable of the same politics of power and wealth. The people know that the Word of God says to care for the oppressed, but they instead manipulate the poor and deny justice to the oppressed. even for four, I will not turn back my wrath. The ultimate marginalized voice is God’s. Now this is missed by atheist postmodern philosophers, though it springs from what they have been writing. As I wrote in my last post, Reality is what is really “out there”—it really exists. And if it really exists, it has a voice. And God really exists “out there,” and God has a voice. God seeks to communicate to us. And so it should not be surprising how much the “Word of the Lord” is at the center of the biblical revelation. God spoke—and the Creation was made. God continued to speak his Word throughout the Old Testament record in the Law and the Prophets. And God ultimately spoke through the “Word become Flesh,” Jesus Christ. God is not silent; he is seeking to communicate to us. But, again, in keeping with postmodern understanding, language is inherently difficult in a fallen world—and therefore, we cannot hear the voice of God perfectly. Or, in other words, though there is a TRUE REALITY that is God, our perception of that reality is deeply flawed. Postmodernists and Christians alike understand that there is a problem with humanity’s ability to listen to the marginalized voice. Christians understand this as a result of our fallenness—that we are mired in sin. Sinners marginalize the voices they do not want to hear, and create stories of their own that places them in power over others (and in the case of Christian history, people have taken the voice of God and marginalized it for the sake of interpretations that place themselves in power over others). God, all the while, continues to speak (His Word is still living and active and His Spirit is still articulate), pleading with humanity to hear his voice, a voice that knows Reality as it really is—the only voice that is the Truth. Because God speaks from this holy place of Truth (“holy” meaning “other, separate, unique”—as opposed to humans who say that they know the “Truth” but are incapable of saying this absolutely), God's words carry Truth about Reality that is beyond any human endeavor. But we must be careful to be chaste in our belief that we can know this Truth totally. God’s message comes to us via the scandal of the particular. It is revealed to a particular people. It is revealed through Himself in the incarnation of the Christ at a particular place and time and language. This language can carry Truth insofar as we can rightly understand it. So, we have the capacity to know Truth, though we cannot know this Truth absolutely (as Paul puts it, "Now I know in part"). This calls us to humility as we attempt to listen to the voice of God. We must insist that no one interpretation can possibly be the end-all, be-all interpretation for all peoples and all times. And, most of all, we must yield to the Spirit of God who is capable of clearing the fog between the Divine voice and our listening ear. The Christian message is one of redemption: That even though we are fallen and cannot hear the voice of God rightly, God supernaturally intercedes that communication gap as we yield to His Spirit within us as believers in Christ. Theology is a never-ending venture that must bring into consideration the many cultures and traditions that make up the biblical faith, constantly listening for God's Spirit in it all. For God is there—pleading with us to hear His voice: the voice of the marginalized, the voice of the One who was so despised, so hated, so oppressed that he died upon the Cross of the powerful and oppressive. If postmodernists are consistent, then they must listen to this marginalized voice. A couple years ago, Anthony J. Carter wrote On Being Black and Reformed: A New Perspective on the African-American Christian Experience. Christians of all races need to hear the incredible insights of Carter--to hear the voice of this African-American about his experience and his ideas about how Reformed Theology can provide substantive answers to the questions surounding the history of slavery in the United States. Another great model of a being "black and Reformed" is my old friend Vince Bacote, who now teaches theology at Wheaton College. A Neo-Calvinist, he is seeking to build on the ideas of Abraham Kuyper as he engages in the theological issues of the 21st Century (I have his paper, "A Neo-Kuyperian Assist to the Emergent Church" published here at VanguardChurch). The further development of what it means to live as God's people in God's world--focusing on the Cultural Mandate of Genesis 1 as the "first Great Commission." The challenge of the commodification of our church experience--where people are discipled more by a mall-mentality than by the Christian understanding of "church." A rediscovery of the importance of the Holy Spirit--transforming a church that is functionally "binitarian" into a truly Trinitarian church. The rectification of deficiencies related to race and ethnicity in our theology--where Vince spells out some of his plans to engage with "liberation theology" as an acceptable theological category, and to employ Kuyperian sensibilities to the task. Good stuff; check it out. Is There a “Reality” That Is True? And Can We Know It? Now, what I submit as a Christian response to this is something radical for both postmodernists and Christians (and therefore, those postmodernists and Christians who are firmly entrenched in their ways of thinking may not like it, but those who are open to dialogical dispute will hopefully engage it). It is this: Reality and Truth are two different things. Reality is what is really “out there”—it really exists. There is a Reality that is not merely a conceptual creation, but is an actual creation. In fact, biblical Christians have understood Creation as not merely a “figment of the imagination” (even God’s imagination), but that it is actual, it is out there, and it (very important to note) has a voice. Let me explain. I really exist. And if you sit in Starbucks with me, and we talk, you will hear my voice. You will hear what I have to say about myself and what I think is important. I will listen to you respond, and I will respond in kind. I am here. I am not just a reality that you have created due to your senses, situatedness, and conceptual languages. I really am here! When we communicate, we come to understand that the other is real. Now, the Creation really exists. And if you listen to it, you will hear it speak—this, after all, is why Science works. We can learn from the material world and harness its potential in new and exciting ways. But science is not all there is to knowing anything. You cannot come to know me personally through a scientific endeavor (by putting me under a microscope and creating some data sheet on me—"Bob’s 5 foot nine inches tall, married to Linda 12 years, three kids, works for the CCO"). That is not how you get to “know” me. You must listen to my stories in order to know what makes me tick—what has formed me, how I have been changed by my experiences, why I do the things I do. And you do not come to know the Creation merely through scientific observation. Anyone who has hiked in the mountains or been to the ocean or watched a hummingbird fly from flower to flower or looked up at the vast expanse on a dark starry night knows what I mean when I say that Creation speaks. It is real. But this is not “Truth.” My perception of this reality is always skewed. My perspective, twisted by my senses, situatedness, and conceptual language, limits my ability to truly hear the voice. I can never say I know Reality truly. I was a communications major at one point in my college career (don’t ask how long ago!). One thing I remember from those studies is that communication is always hindered because the message gets garbled between the speaker and the listener. And the greatest garbler is the listener’s perspective (There’s nothing new about this—this is a modern scientific observation. Postmodernism simply realizes this as well). So, if you and I are in Starbucks, and I say something to you about myself (say, that I am a huge football fan), you most likely will misunderstand some part of what I am saying to you (and that misunderstanding is exacerbated if we have different cultural backgrounds, and thus different conceptual languages for Reality! If you were from Europe, you might believe that I love Soccer…and let me assure you that is not the case!). So, we talk back and forth, clarifying, rearticulating, seeking understanding. Why? Because I am real, and I want you to hear my Real Voice. But in the end, do you know the Truth about me? Have we exhausted all that there is to know about me? Did you understand what I was explaining to you perfectly? No, no and no. You know in part, but you do not know in whole. You do not know the Truth. That is the difference between Reality and Truth. I can affirm that there is Reality out there if I hear its voice. I can get closer to understanding that Reality as I enter into dialogue with it. But I must realize that I am never going to know that Reality perfectly. Reality and Truth are two different things; and between now and Eternity, that is the way things are. “Now we see but a poor reflection as in a mirror; then we shall see face to face. Now I know in part; then I shall know fully, even as I am fully known” (1 Cor. 13:12). My wife and I have decided to invest in the ministry of World Vision as they respond to the hurricane tragedy. World Vision has been shipping emergency supplies and other essential items specifically to the children and also to families in the Gulf Coast region. World Vision will continue partnering with churches to help children and families that have been devastated by the hurricane and rebuild their communities. Your gift today will help provide relief to victims of Hurricane Katrina through World Vision's American Families Assistance Fund. In case you missed it (which I did, since I was away all summer), the "Cover Story" on PBS' Religion & Ethics Newsweekly on July 8th and 15th featured "The Emerging Church." It featured interviews with Emergent leaders Brian McLaren, Doug Pagitt, and Tony Jones, with evangelical professors Don Carson and Scot McKnight offering their observations of the movement. Text and video of the July 8th episode can be found here. Text and video of the July 15th episode can be found here. Is the pledge unconstitutional? The first amendment to the US Constitution says, "Congress shall make no law respecting an establishment of religion, or prohibiting the free exercise thereof..."
So, I'd say, yes. The pledge is unconstitutional. For if a school were to force my children to make a pledge of allegiance "to the flag of the United States of America," this would be counter to my family's religion, which tells us to make no other pledge of allegiance except to our God. Coersion to recite such a pledge would prohibit my family's free exercise of religion. Consider that thought while listening to all the Christian rhetoric about "under God" in the pledge. It is as good an argument (if not better) as Michael Newdow's argument. They just won't leave Bush alone. Longtime Bush watchers say they are not shocked that he missed his moment--one of his most trusted confidants calls him "a better third-and fourth-quarter player," who focuses and delivers when he sees the stakes. What surprised them was that he still appeared to be stutter-stepping in the second week of the crisis, struggling to make up for past lapses instead of taking control with a grand gesture. Just as Katrina exposed the lurking problems of race and poverty, it also revealed the limitations of Bush's rigid, top-down approach to the presidency. "The extremely highly centralized control of the government--the engine of Bush's success--failed him this time," a key adviser said. Another hallmark of postmodernity is the critique of the Enlightenment reliance on “Reason” or “Rationality” as the objective and neutral arbitrator of the truth. As Christians, I feel that we must affirm that any attempt to “know reality” is futile through the use of Reason or Rationality. Reason and Rationality are constructions of a Western mindset—and it is presumptuous for us to believe that our ideas can be accurate descriptions of Reality if we strictly adhere to some arbitrary “rules of logic” in order for our ideas to directly correspond with reality. So, it seems to me that Jesus is using language to convey to us ideas about who he is as a person. He is not telling us that there is some ontological “bread” or “gate” or “vine” that I must epistemologically know through objective reason. He is instead conveying to us words that lead us toward who he is—not perfectly (for language is incapable of creating a one-to-one correspondence to Reality and must always be interpreted within the constraints of my linguistic context), but metaphorically. When Jesus says that he is the “truth,” it’s a metaphor for something more complex and more relational—like the metaphors of bread, light, gate, shepherd, resurrection, way, life, and vine. He is “the way, the truth, and the life”—in other words, Jesus is the revealer of how to get to God, the author of life. Now with that said, what about "objective truth?" Isn’t our modernist desire to believe in “Truth” (as in an objective, rationally arrived at “truth” that is “out there” to be discovered), really idolatry? Where in Jesus’ words do we hear that in order to “know truth,” we must objectively use the rules of reason? Jesus simply says that he is the truth. And elsewhere Jesus also says that if you are one of his disciples, you “will know the truth, and the truth will set you free?” What kind of "knowledge" was Jesus talking about? Was he saying that the knowledge that comes through Reason will set you free, or something else? The point is this: Jesus is calling us not into knowledge through a modern epistemology (that seeks a scientific understanding in which we objectively learn "truth" verifiable through the rules of reason and science). Today I begin interacting with the blog-book, A New Kind of Conversation. Bruce Ellis Benson starts us out with a very helpful overview of postmodernity, and I have submitted my thoughts on Lyotard as a comment. Brian McLaren offers an essay on "Spiritual Formation in a Postmodern Context" as well. The AP offers this story, entitled Prayer and Sense of Purpose Follow Katrina. At the First Baptist Church in Knoxville, Tenn., church members held a prayer meeting for the 70 or so evacuees who have been using the building as a shelter. The Rev. Bill Shiell, pastor of the church, said churches involved in the relief effort are experiencing a spiritual awakening — about social service as well as faith. Church members now have a new sense of purpose and are making connections with people they never would have met otherwise, Shiell said. The Rev. Rick Warren, pastor of Saddleback Church in Lake Forest, Calif., and author of "The Purpose Driven Life," toured Gulf Coast churches over several days and said he was struck by the level of cooperation between black and white churches. One church that is providing shelter said it held its first wedding ever for a black couple, both evacuees. "This has changed our church," Shiell said. "Revival here has already happened, by virtue of our hunger to do something. When the Red Cross called, we were ready. If that isn't revival, I don't know what is." We all need to learn a lesson here. Faith must never be separated from social service. The presumption of the AP writer (did you catch it above?) is that the two are not the same. But the Gospel of the Kingdom of God does not create false dualisms--as if prayer (or Bible study or evangelism or any of the other pious things that we label "sacred acts") is a function of "faith," while serving others in the wake of a tragedy (or working for systemic social change or proactively seeking racial reconciliation or advocating for the poor) is a non-sacred function of something else. Only God can bring this kind of "good" out of a horrific event like a hurricane (Romans 8:28). Will we listen and learn? Here is my imitation of every Senator asking Roberts a question. "I would like to point out how stupid the other party is and would like to talk about how stupid the remarks of the last Senator are. Now I would like to grandstand for a few minutes and make you, the American people and the rest of the Senate listen to my ideas on the judiciary for an extended period of time. After grandstanding I will now ask Judge Roberts a question. But, upon finishing this question, I do not want him to answer until I pontificate for a few minutes longer and give my opinion on the matter at hand for another extended period of time. After talking about myself and how in touch I am with the will of the American public (at least from listening to my staffers tell me what the masses desire), I will give you time to answer my convoluted question. Of course, I can interrupt you at any time to grandstand and pontificate a bit more. 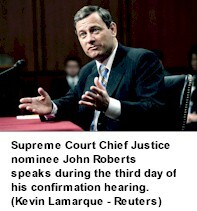 Judge Roberts, please answer the question." The problem with metanarratives is not that they are “big stories,” but that they are “little stories” masquerading as big stories. As Jamie Smith writes, “Postmodernism is not incredulity toward narrative or myth; on the contrary, it unveils that all knowledge is grounded in such.” A metanarrative, according to Lyotard, is a locally-born story that seeks to explain Reality and legitimates its perception of it by way of Reason as the ultimate arbitrator. So what we end up doing is playing “language games” in order to “prove” the stories that we want to believe—the language-games of modernity are its appeals to “Reason” and to the scientific method. Christians can affirm, as we did in the previous posts, that human metanarratives are constructed within the situatedness of local communities. Therefore, they are not “universal” at all; they are simply social constructs, and it is pretentious to think that any single community’s worldview could possibly be universal enough to rule over all. At first, this sounds like a swipe at Christianity. But if we are honest about it, we do see that when any people come up with a “Truth,” this often is no more than the “will to power” flowing through the manipulation of language for the sake of making one set of beliefs rule over all others. The evidence of this ugly aspect of human depravity is seen by just looking at Marxism or Nazism or Freudianism or Darwinism or Western Capitalism in the past 100 years. Look at today’s radical Jihadist form of Islam and the retaliatory violence that results when the West fights back with its imperialistic-looking retaliation marked by the metanarratives of capitalism and democracy. All of these are attempts to create universal metanarratives that are professed to be “true” and “good” simply because the ones in power say they are. It has admittedly been evident even in Christianity—for the history of the Church is littered with the corpses of those who would not submit to the Church’s conception of the “true” and the “good” as defined by the people in power. It does not have to issue in bloodshed to be a power-grab, either. I believe that the main problem with the Religious Right's "Christian" agenda is an issue of power--their politics are power-grabs in order to violently thrust their conceptions of the "true" and the "good" upon the rest of the American public. Postmodernity points out that metanarratives that say they are “True” simply because we either point to “Reason” or some local community’s interpretation of an authoritative text to legitimate it often lead to violence. And we, with tears in our eyes, have to agree. “Regimes of Truth” (as Foucault calls them) forged in local communities are not universal enough to rule over anybody, for they are created by fallen people from their myopic viewpoints and within the context of their limited conceptual languages. Is there a story that does the opposite? Is there a story that, instead of thrusting a worldview onto people through violence, tells us that we are to receive violence unto ourselves as a means to the “true” and “good”? Is there a story in which, instead of violently enslaving people to another people’s ideology, actually seeks to set people free? Is there a story that, instead of feeding on rules of order that induce guilt, offers a kingdom governed by forgiveness? Is there a story in which, instead of creating exclusionary parameters that force people out and marginalizes them, creates a life of inclusion that actually reaches out to the marginalized? Is there a story that, instead of privileging a single group’s interests, actually seeks to be for the good of all Creation? Is there a story that, instead of being a universalized small story legitimated by way of the “authorities” of Reason or Interpretation, is in fact big enough to be universal, without any appeals to outside authorities? Is there a story so big that no single local interpretation of the story could encompass its scope, so that we'd have to include many different voices to rightly scratch its surface? I’m situated in a local community—and that’s okay! Among ideas that feed into a distrust of metanarratives is the postmodern belief that all attempts at creating universally true worldviews are, in fact, social constructions of local communities that can only understand the world through their community’s peculiar conceptual language. We Christians must affirm this point. Whereas modern thinkers thought they could master language through the science of linguistics, postmodern thinkers offer the helpful insight that no matter how much linguistic work one does, the data is only applicable to a local community. No single community’s conceptual language better describes reality than any another’s. They each simply give their point-of-view. Just about every postmodernist insists that language situates us, and that no one conceptual language or vocabulary is universal or absolute because every conceptual language is limited by the context of the community’s situatedness. For instance, because I was born and raised in suburban Ohio, I have a different construction of reality than, say, those in an Eastern and impoverished community, and vice-versa. If postmodernity is right that all metanarratives are social constructions, then deconstruction is the only right thing to do to them—in order to understand how those local communities built these concepts in the first place. We need not fear postmodern deconstruction—for it is beneficial because it tears down what Bruce Benson calls the “Graven Ideologies” of modernity. Once our modern idols have been destroyed, we Christians will be capable of living a more pure Christian faith. Scot McKnight (at Jesus Creed) is beginning to offer a way forward into understanding the unity of Scripture beyond a "Systematic Theology" method with his ideas about a "Soundings Approach" to reading the Bible. "What a soundings approach may have in its favor is that it accepts the limitation of every language game played...A systematic approach tends to flatten the variety and homogenize the variety, and I see no biblical warrant for such flattening or homogenizing...The sounding approach knows that each witness is one divine articulation of the grand redemption of God; it knows that the attempt to draw these diverse threads together strains each...and it lives with the inevitable limitation of our knowledge and our articulations of the message of the Bible." Very postmodern, and very Christian. Brother Maynard has a very insighful post that will get you started thinking about church size and satellite churches. "Megachurches are well suited to the 'bootstrap theology' of the word-faith set, where a 'bigger, better, faster, more' mentality would seem to be right at home. If you think that one of the reasons to be part of a church has to do with networking for your business, this is the place for you. " "If you feel that your calling is to provide a place for already-christians to get together in a contemporary fashion so their needs can be met in the newest ministry model, then there’s nothing wrong with doing it well so you can gather these people and Maslow the Hell out of them. I promise I won’t embarass you by asking you for chapter-and-verse to support your calling. Just don’t call that the Great Commission, and please don’t keep talking about the numbers and the endless ministries and all the campuses — frankly, I don’t care." Bro. Maynard then interacts with Andy Stanley's contention that a church must be big enough to sustain Jr High and Sr High ministries: "I continue to wonder about the idea of youth church or a parachurch group or jointly-sponsored group (as described in 4a above) that provides this outlet. Clearly we aren’t there yet… but is it something that’s advisable and attainable?" "...the churches in the time of the Apostles were all house churches, and that there’s nothing wrong with that model....we’ve come so far from the mindset of embracing the small that we actually have to argue it’s validity. Sad." "Church size - maybe there’s nothing wrong with a MegaVenti church… but I might want to see it divided and poured into about 18 cups so that it can spread out and shared properly." When many Christian thinkers read Lyotard’s definition of postmodernity (the “incredulity toward metanarratives”), they obviously hear, “incredulity toward any grand story, including the biblical story of redemption in Christ” (even though this is not what Lyotard meant by his definition—see the previous post). This broader definition causes trepidation for Christian thinkers, for it is in conflict with the Christian contention that there is a grand story that explains reality—often outlined as “Creation-Fall-Redemption.” “Neo-Lyotardism” (as I'm calling this incredulity toward any grand story that offers universal meaning), is indeed trickling into the popular culture. What are the proper Christian responses to these beliefs? Let’s enter into "dialogical dispute" with each. In this week’s posts, we will explore what I think may be good Christian responses to the above list. What do you think of Satellite Churches? Phil Steiger (over at Every Thought Captive) has started a good conversation on Satellite Churches. almost 1,000 U.S. churches [embracing] a multisite approach, according to the Leadership Network. Sometimes called a "satellite" or "franchise" model, going multisite is seen by advocates as one of the leading innovations of the 21st century and by critics as a sign that the church has sold out to consumerism—becoming just another big-box retailer, selling salvation with convenient hours and a discount price. The answer, as usual, lies somewhere in between." If the answer lies somewhere in between, what is it? I read that CT article with great interest, both because I once started a church plant myself in my family room and felt the struggles and anxieities that only church planting pastors feel (you know what I mean!! ), and also because the church we have been attending in the last year is a megachurch (2,000+) that is starting a "satellite" campus in the city near them (they are an affluent suburban church, and they are placing the satellite in the high school of a small, blue-collar city near them). I keep going back and forth on the issue. The city they are satelliting to has no church that offers the quality of worship and the "Christian services" that this church can offer through a satellite--thus attracting some who would not normally go to church. This is a good thing--a church seeking to reach a community with offering its excellent ministry. But I'm troubled by the start-up campaign: It is all about making the Sunday worship event successful--nothing really about creating Christian community. They need greeters, worship leaders, communion servers, Sunday school teachers, etc. The reason I bring that up is this: Satellite churches are in danger of making the Sunday worship event so central to ecclesiology that they miss becoming a transformative kingdom community. It's all about seeing a good show--excellent worship, a first-class sermon shown via DVD, an excellent children's program. I'm afraid of the church becoming a show where many come to watch, but few come to mature. I'm afraid of a church where the pastor is nothing more than a speaker, worship is nothing more than a concert, and church is nothing more than the building where you go watch this stuff. One of the key issues in responding to postmodernity is to understand what postmodernity means by the “metanarrative.” Jean-François Lyotard wrote in 1979, “Simplifying in the extreme, I define postmodern as incredulity toward metanarratives.” Ever since, this concept of the “metanarrative” has leaped front and center in discussions on postmodernity in Christian circles, for it seems to give us a simple definition that we can easily grasp. However, Lyotard’s conception of “metanarrative” has taken on a life of its own beyond his original intention. James K.A. Smith explains in an essay (which originally appeared in Faith and Philosophy journal and republished in Christianity and the Postmodern Turn) that what Lyotard meant by “metanarrative” is a distinctly modern phenomenon in which people create grand stories and seek to legitimate them via an appeal to universal reason. Lyotard’s point is that, in the view of postmodernity, there is no such thing as an objective, neutral rationality beyond narrative. Therefore, any narrative that appeals to this “phantom Reason” to legitimate itself must be seen with incredulity. This, I submit, is not antithetical to Christian faith; rather, it is antithetical to modern philosophy (with its grounding in “Reason” as the basis for all knowledge, as if “Reason” existed outside the parameters of any person’s belief system). What many Christians are reacting against in postmodernity is not Lyotard’s definition of postmodernity, but a Neo-Lyotardism that takes this rather complex understanding of “metanarrative” and simplifies it to just meaning "we must be suspicious of all grand stories." This neo-Lyotardism is indeed a challenge to the grand story presented in the Bible, for it has crept into the public consciousness and is expressed by some “postmodern critics” of Christianity. There are a number of possible Christian responses to neo-Lyotardism (I will offer a few posts coming up on this), but the first response is this: Let’s get Lyotard right! Christians can point out that his definition of postmodernism is not against the grand story just because it is big and seeks to explain all of life; rather, he said that postmodernity, ultimately, is skeptical when anybody presents a grand story and then says it is true because Reason proves it to be so. He actually is saying that all of life is explained by narrative and myth, that the only way to understand reality is through story and faith in those stories. And Christianity is a story—a narrative that needs no appeal to “Reason” for it to explain what is true. It is a grand narrative accepted by faith as you immerse yourself into the story—the story found in the Bible and its continuation found in today’s Body of Christ. Before we get started, I wanted to note what seems to be a spectrum of reactions to the postmodern turn. Very helpful in my delineating these was Kevin Vanhoozer’s essay, “Pilgrim’s Digress” in the book, Christianity and the Postmodern Turn. Deny- Some Christians simply deny that postmodernity either exists or that it’s important. Some may see postmodernity as “just a phase,” as Brian McLaren has refuted. We have a tendency, in our humanity, to decide that the way we see the world is the only possible way to do so, and we get emotionally attached to it as a source of security. That is why we have trouble talking politics or religion with people—each of us are “set in our ways,” and to change is paramount to “conversion.” Much is the same with this—to say that we are moving out of one era and into another (from the “modern” to the “postmodern”) is a bit too much for some to swallow. Defy- Some Christians (especially evangelicals) define themselves as much by what they are against (we are called “protestants,” after all!) as what they are for. Constantly on the hunt for heresy and those dreaded “liberals,” they are ready to demonize the next threat to the canonized way of thinking about their faith. Many Christians have been so thoroughly inculcated with a Platonic worldview and/or the “reasonableness” of the faith (i.e., the “Evidence that Demands a Verdict” kind of apologetics), that they see any threat to these as a threat to the faith as well. So, postmodernity is seen as the next evil coming down the road that threatens the orthodoxy of our faith—something to resist at all costs. Some Christians simply presume that postmodernity and Christianity are mutually exclusive—and with that attitude, there is little room for understanding and getting beyond the defiance. Deify- Some Christians are always looking for the latest fad or trend that will enliven their faith and move the church toward a more missional focus. Postmodernity is new and exciting and offers new ways of thinking about our faith and for doing ecclesiology, so it is often embraced without enough criticism and discernment. We see some in the “emerging church” (certainly not the all, but some) either grab hold of superficial postmodern ideas or let a more informed postmodern philosophy set the agenda for their theology. We must not deify any philosophy (be it Derrida or Plato! ); we must yield to Deity as we seek to understand our faith. Discuss- Some Christians (especially those in the “Emergent Conversation”) have, because of a predilection toward the postmodern, encouraged a more conversant approach. They create a more open forum in which all views are welcome and given equal voice—especially newer, fresher voices that articulate postmodern ideas. While this has the virtue of listening to ideas on their own terms, it does not necessarily always have the apostolic Christian faith as its starting point. Sometimes, in our zeal to be in tune with the culture, we can allow the culture to be our starting point rather than the faith. We have a “faith that seeks understanding,” not the other way around. Dialogical Dispute- Vanhoozer calls this just “Dispute,” but I think that has the connotation (which he does not mean) of a heated confrontation. What he means, and that I agree with, is that the best possible response to postmodernity is to listen to and engage postmodernity on its own grounds while at the same time to “contend for the faith that was once for all entrusted to the saints” (Jude 3). He writes, “Christian thinkers cannot go around postmodernity; we have to go through it.” This will mean that we will must be willing to agree with postmodern theses while in this dialogical dispute so that we will may arrive at different conclusions due to our distinctly Christian World View. For instance, we can agree with postmodernity that we should have an incredulity toward metanarratives, for we agree that every metanarrative is limited by linguistics and the situatedness of each community from which it springs. However, we can also contend that there is an exception—a metanarrative that came from outside any individual community and has invaded our time and place situatedness in language that had to accommodate to an individual community (the metanarrative of “Creation, Fall, Redemption”—which will be my next post).